Although the soundtrack section isn’t always appreciated by players, the music in video games is of vital importance. Is there, therefore, a way to musically optimize a video game project with a light weight format, which has good sound quality and is completely modifiable until you are able to create your own soundtrack? In this post I will explain what a MIDI music file is and what benefit it provides in video game design. What is a MIDI file (.mid)? As always, I am going to explain it in my own words in order not to fall into the trap of using complex expressions and prevent you from getting frustrated and leaving the page. 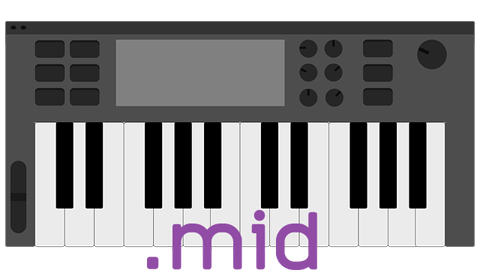 MIDI stands for “Musical Instrument Digital Interface”, and was invented to facilitate the compatibility between manufacturers of electronic musical instruments. Nowadays it is a sound format that isn’t only used in applications from the world of music (with the production of popular music, in cinema and television), but also in any home-made multimedia project which may end up becoming something much bigger, like what happens in music for independent video games. Due to the efficiency of this format when it comes to working with data of any size and with astonishing speed, practically all music composition programs use it. I am referring to MIDI synthesizers. Surely, if you have already used a program for composing music, you will have used this format without realising. It is also likely that you have used well-known “samples”, which are pre-recorded sounds, generally in WAV format, which weigh more than lead, which you cannot modify and which therefore doesn’t allow you to personalize much of your musical compositions. Although the WAV format is essential when it comes to mixing recorded sounds (as is the case with a singer’s voice), it is not strictly necessary to use these audio formats to create instrumental background music. And the truth is that the MIDI file isn’t an audio file, instead of containing data sampled in wave forms, it contains instructions so that the synthesizers or sound generators perform and sound. Said instructions show the notes to play, the volume, the intensity of the stroke, what instruments must sound, the tempo and its variations, and many more things. All this data is contained in a MIDI file. Surely you will be drawing the conclusion that if you get a song in this format, you will be able to edit it and do whatever you want with it. Most video game engines accept this format, allowing playing songs on any operating system for which the project has been exported. With this, an extremely small game is achieved when it comes to its size, which speeds up the speed of execution. And if you are one of those who believe that a song in this format doesn’t sound good or is of low quality, it is because you still don’t know how it works. Did you know that many video game consoles from the past played a large part of their music in formats with the same characteristics as MIDI? Final Fantasy VII or The Legend of Zelda: Ocarina of Time are an example of this. And, yes, the majority of covers made by fans of the songs of these video games have been made based on the MIDI version of these songs, which have been circulating on the internet for years. You can also easily make your own version. Given that a MIDI file is only responsible for giving information to the player, during the reproduction of the song in this format, both the instruments and all of its structure can be changed. Today, video game engines such as Unreal Engine or Unity have plugins or assets to carry this out, using their own synthesizers or even “SoundFonts” and other types of files which compile instruments to add quality to the music and thus giving it its own personality. With this, your video game’s soundtrack will vary depending on the events that come up according to the player’s decisions, and thus making it more unpredictable, apart from considerably reducing the size of your game. An example of this is the game Shadow of the Colossus, in which a song could change until becoming more intense as the player threw himself/herself into combat against a Colossus. The aforementioned is maybe more for advanced video game developers or those with a lot of programming experience. So, let’s discover other advantages of this format. I will discuss this in more depth in another post. But let’s at least have a look at it. It turns out that there is a lot of original “background music” which is available in this format so that you, yourself, can freely edit it and create your own songs. This music does not even belong to any specific project, it was created with the purpose of helping those non-musicians who seek to personalize, in detail, the music that will play in their multimedia projects, as is the case of independent video game developers who do not have much musical knowledge. This background music is available on this website where you are now. Most of my royalty-free songs have a MIDI version, and you can get one of my free packs by simply subscribing to my newsletter. Subscribe now and get FREE 10 of my songs in MIDI format! I am talking about taking any of my existing songs and transforming them with any music production software into whatever it is you want, and also using them in your commercial projects. This is only an example of small changes. Actually, with a little musical knowledge, you can completely modify the song and make it sound nothing like the original. If you want to be a creator of music and make your own soundtrack, sooner or later you’ll end up working with this format. Have a symphony orchestra at home? Have a team of sound engineers creating their own electronic instruments? Use big mixing desks and huge audio programs? This isn’t necessary any more. Do you know how much the song that I posted above weighs? Heroic Intrusion in MIDI format is only 24.7 KiloBytes. The insignificant size of these files allows any low-power computer to work with musical arrangements with the processor hardly having to do anything. Of course, it will depend on the musical production software you are using if you want to export your song in audio format like WAV/Ogg/MP3/FLAC after having assigned real instruments or complex synthesizers. But if you want to carry out your own soundtrack idea, your own original music for your video game / podcast / YouTube video or whatever, this format is just what you’re looking for. To make your own background music on your computer you will need a digital audio editing program that has a sequencer which supports MIDI multi-track. Any Digital Audio Workstation (DAW) is perfect for this. If you want to know more and get free MIDI files, download MIDI & Chiptune Music Pack Vol. 1 and start letting yourself be inspired. You are free to use my songs in this format and modify them in order to create your own original soundtrack. Leave a comment if you want to tell me something or ask me anything. And don’t forget to subscribe to my newsletter to join my musical world!